Raspberries, blackberries and blueberries are being sold in leaning towers at the farmers market right now. Here’s an easy recipe* I’ve been hooked on this summer that makes good use of fresh berries. Preheat oven to 350°F. Line an 8×8-inch pan with aluminum foil. Spray lightly with cooking spray. In a small bowl, mix crumbs and melted butter. Press mixture firmly into the bottom of the prepared pan. In a food processor (or with an electric mixer) blend cream cheese, eggs, milk, sugar, cornstarch, lemon juice, and lemon zest just until smooth. Do not over-beat. Pour the cream cheese mixture on top of the crumb crust. Scatter raspberries and blueberries on top. Bake 35 to 40 minutes, or until touch to center feels slightly firm and set. Cool completely before cutting. Use foil to lift cheesecake out of pan and onto a cutting board. Use a sharp knife to cut into clean-looking bars (wiping blade clean with a paper towel between cuts). Refrigerate until ready to serve. *Adapted slightly from Recipe Girl. 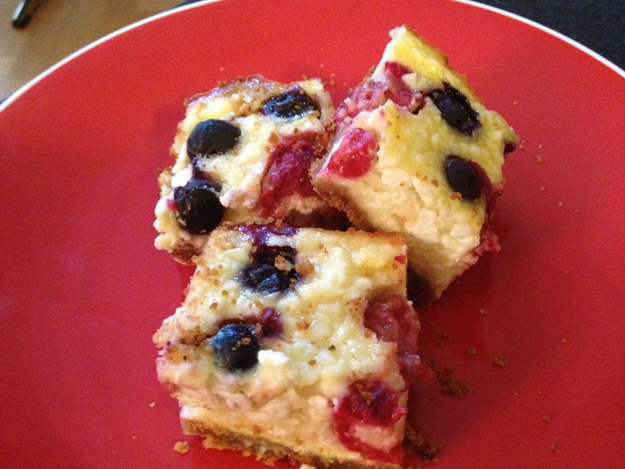 This entry was posted in create and tagged berry cheesecake bars, Recipe Girl by lhouse. Bookmark the permalink.